After weeks of rumours, Environment Minister Peter Kent confirmed Monday that Canada is officially pulling out of the Kyoto Protocol. Echoing the United States, our government has long complained that China, India, and other large developing countries are not required under the current phase of the treaty to reduce their greenhouse gas emissions. Instead, say our leaders, any fair agreement ought to treat all major polluters — rich or poor — equally. Due to the usual distaste amongst politicians for clear statements for which they can later be held accountable, I have been unable to find out in precise detail what Mr. Kent means by his demand for equal treatment. (Not all equalities are created equal, after all.) As far as I can tell, there are two likely possibilities. One is that he wants both developed and developing countries to commit to the same percentage of emissions reductions. This would be an absurd and deeply immoral proposition. Canada’s greenhouse gas emissions per capita are four times those of China and thirteen times those of India. For all three countries to be legally required to reduce their emissions at an identical rate would preserve this inequality in stone and amount to nothing less than climate apartheid. Of course, China and India both have higher total greenhouse gas emissions than Canada, as they have vastly larger populations. But this measurement is not very relevant. Nation-states are artificial entities; only people truly exist. Accordingly, countries must be judged by the greenhouse gas emissions of the individuals who live there. The second — and more charitable — interpretation of Canada’s position is that our government favours equal levels of per capita greenhouse gas emissions in every country. On the face of it, this is much fairer, but it is also historically myopic. 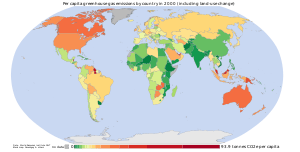 More than two-thirds of the carbon emissions ever produced have come from the small portion of humanity concentrated in the developed world; the imbalance is even greater when calculated in terms of per capita emissions. This trend is now changing, but it is hard to dispute the historical importance that the burning of fossil fuels played in the economic development of today’s rich countries. Thankfully, more alternatives exist today, and it is incumbent upon industrialized countries to transfer technology and accelerate the establishment of an effective Green Climate Fund in order to facilitate sustainable development around the globe. But to the extent that it is true that, in our flawed world, at least some fossil fuel use will continue to be necessary for now to give developing countries the economic advantages already exploited by developed countries, it is only fair that they be allowed to eventually achieve a higher level of per capita emissions (they’re still a long way off), and to maintain this legal leg-up until their citizens’ standards of living begin to approach our own. Total global emissions need to go down sharply enough to avert catastrophic global warming, but how this burden is to be distributed across the world remains an open question. Intuitive standards of justice demand that the principle of “common but differentiated responsibilities” from the United Nations Framework Convention on Climate Change be respected. So does the recently signed deal at the UN COP 17 conference in Durban achieve this goal? It’s hard to say, since not much was agreed to aside from a commitment to negotiate the real agreement by 2015. There is language acknowledging that this future agreement will take the form of “a protocol, another legal instrument or an agreed outcome with legal force under the Convention applicable to all Parties” (my emphasis). But whether or not all parties are to make an equal sacrifice is not specified. Nor, for that matter, are concrete emissions targets. Considering the urgency represented by the risk of runaway global warming, any delaying tactic — which is surely what the Durban platform amounts to (the predicted 2015 agreement is not meant to take effect until 2020) — is a step in the wrong direction. And Canada, as expected, has abandoned it. Time and again, we are proving ourselves to be on the wrong side of history. No amount of griping about China and India is going to change that. This entry was posted in Canadian Politics, Environment, Global Politics and tagged China, climate change, climate justice, COP 17, Durban, global warming, India, Kyoto Protocol, Peter Kent by David Taub Bancroft. Bookmark the permalink.